Recently the gallery turned 7! To celebrate this achievement Nicola made seven silver pendants to auction for the children's charity Jeremiah's Journey. 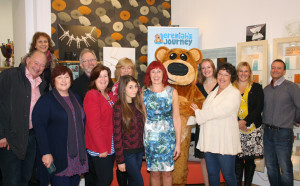 Each pendant was unique and they raised £1430! A huge thank you to everyone who bid, to the winners, and to everyone who supported nicola along this Journey. Here are a few of the bidders with the Bear Jeremiah in the gallery.